We just finished up an epic week of Road Tripping and Car Camping with our Boston Nieces and Nephews. Here's some gear I tried on it that really delivered. Maybe this will be helpful for your next adventure? 10L Mangrove Backpack / 10L Quecua Backpack - these are basically the same small backpack under two different brand names on Amazon. These backpacks *rock*. For around $10, you get a compact, well made bag. The size is just right for kids, as it lets them store essentials without ever getting too bulky. This past trip, everyone from 8 year old Chana to 4 year old Gavriella carried their "adventure bag" pretty much everywhere. 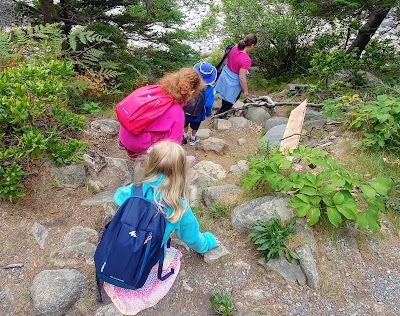 When the kids were hiking the bag contained: a water bottle, snack, disposable poncho, Heat Sheet emergency blanket, compass, whistle and flashlight. The bag had enough room to cram in a toy and any shells or rocks found along the way. The kids never complained about the bags, and whenever they were thirsty or hungry, they knew where they could turn. Even Gavriella, who didn't go into the woods this last trip, carried her adventure bag throughout Plymouth. I'm all about kids being (relatively) self sufficient, and this bag lets them carry their essentials without weighing them down. Cold Steel Bird and Trout Knife - I'm not much of a knife guy, but after being frustrated with the locking mechanism of the Gerber STL 2.0, I wondered what other options are out there. Looking around, the Bird and Trout Knife caught my eye. Like the STL, it was compact and lightweight. It's also a fixed blade, so it has no locking issues. I wondered how it would handle as both an outdoorsy knife for me, as well as an option for a knife beginner. In many respects, the Bird and Trout knife did awesome. You wear it around your neck and it's surprisingly comfortable. I put it on when I got to the campsite and didn't take it off till I had to check it in my bag to avoid getting stopped by TSA. The blade is nice and sharp, and a reasonable size - just about the same size as the Gerber STL that I was considering replacing. It took a bit of research, but I finally got the hang of locking the knife in the sheath, which it fit well. For nearly all simple camp tasks, from cutting rope to opening food packages, the knife was awesome. As for cons, the sheath that seemed so definitively locking when I got it, already seemed to loosen up in the span of the week. I doubt the knife will go anywhere while hanging on my neck, but it's disconcerting that I can now tug on it and the blade can slip from the sheath even without pushing the thumb lock. The biggest con, however, is that for larger tasks you simply can't muscle this knife. I could shave a point on the end of a hot dog stick and all, but attempting to attack larger chunks of wood in a more aggressive way was just plain too uncomfortable. The thin handle cuts into your skin and reminds you loudly that this a knife for delicate work. Shira's bulky locking blade knife was far easier on the hands for bigger tasks. Ultimately, I think the Bird and Trout Knife is a winner. It's super lightweight and for the majority of simple camp tasks I do, it's perfect. The neck carry, in an outdoor context, is also ideal, as it means that the knife is always at hand. I've considered using it as an Every Day Carry knife, but I think that's probably a non-starter. Assuming my shirt is baggy enough, nobody would notice I was wearing a neck knife. But getting it out in public and putting it back is just an ungraceful thing to do. For now, the knife lives with my camping gear and will be pulled out for hikes and camping trips. As for being optimal for the new-knife user, I'm honestly not sure. I'll have to let M and P experiment with it, and I'll report back. Sharpie Twin Tip Marker - with four children and a bunch of different stages to our trip, I found that one of the most useful things I carried was a Sharpie. Water bottles and snacks could be instantly assigned. Clothes for different activities could be dropped into a white garbage bag and then labled for easy retrieval. It may be simple, but man was my Sharpie useful. The spark this little guy throws lights the Pocket Rocket with ease. While I always carry a lighter on me when camping (and in general, if possible), it was super convenient this last trip to have a spark generator that lives in the case with the stove. 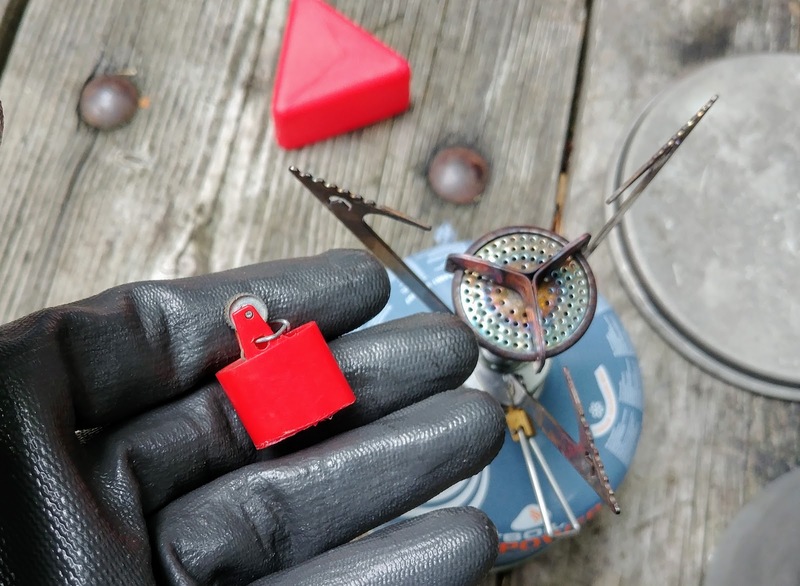 If you have a backpacking stove, you need to make one. 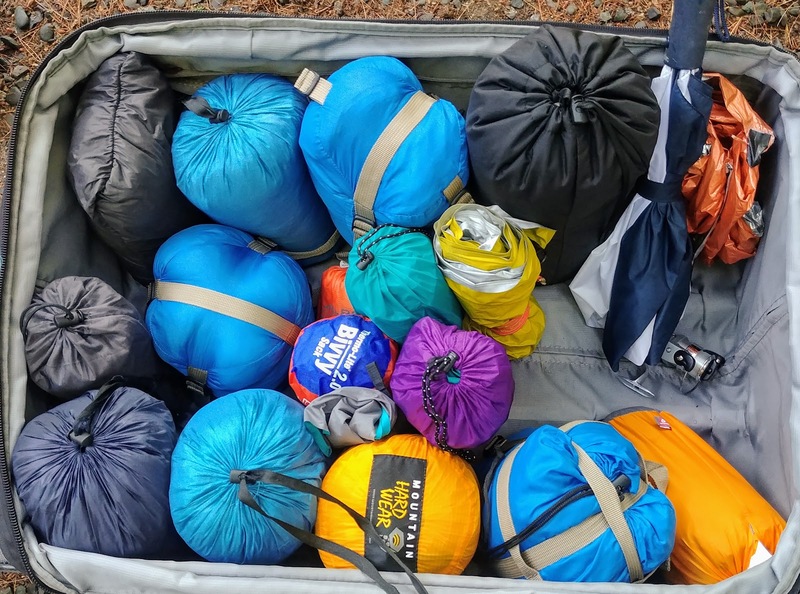 Double Black Diamond Packable Throw - much has been written in the backpacking gear community of the cheap Costco down throw that can be re-purposed into a down sleeping quilt. We picked up a two pack of these down throws for $42 (spending an extra couple bucks because we're not Costco Members) and they worked really well for increasing the warmth rating of the Recamp Ultralight Sleeping Bags the kids used. This way, we didn't have to invest in bulky, cold weather bags that I couldn't imagine us needing anytime too soon. 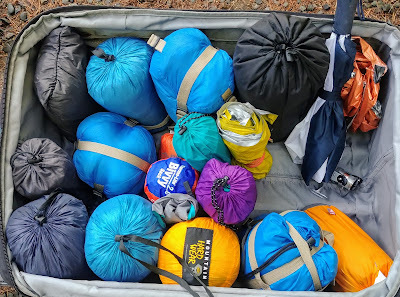 Consider that the above picture has 5 sleeping bags, 5 pads, 3 throws, 1 down jacket, 1 emergency bivvy, 2 pillows, and there was still enough space to cram a 6 person dome tent in there. Sure, the bag weighed 48lbs, but as long as it was under the airline's 50lb limit we were good to go.